I was actually wary to read Linger after I finished Shiver. But I’m so glad I did because of loved Linger! The old characters that we already knew--like Sam, Grace, and Isabel--grew and changed into different and more complex people. We also met new characters, most prominently the deliciously snarky Cole St. Claire. Plot-wise, I felt as though Linger didn’t deliver too well. Looking back, not much really happened until closer to the end. But, the way Maggie wrote the novel, alternating perspectives between Grace, Sam, Cole, and Isabel, kept the pace going quickly, so I didn’t notice too much as I read it. Cole was absolutely my favorite character, he was witty and hot! But he was also extremely damaged, which made me want to just give him a big hug and tell him it would all be okay. I still love Sam to death, and Grace is still that practical, tough, and sweet girl that we all love. But there’s something different about her, something dangerous and certainly lethal. What I love most about this series is that Maggie’s writing style is one of the best I’ve ever read. So very lyrical and poetic, descriptive in just the perfect way to transport my mind to the scene. And she made these amazing, extremely fleshed out characters, each with their own problems and significance. It’s amazing to read. I give this novel 4.5 out of 5 stars. 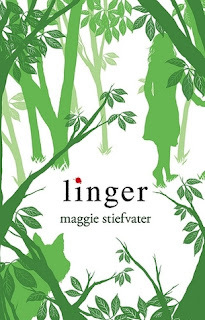 I still need to read Linger. Like yourself I'm very skeptic of it because I wasn't really in love with Shiver. I have this on my shelf though so I just have to get around to reading it soon! !